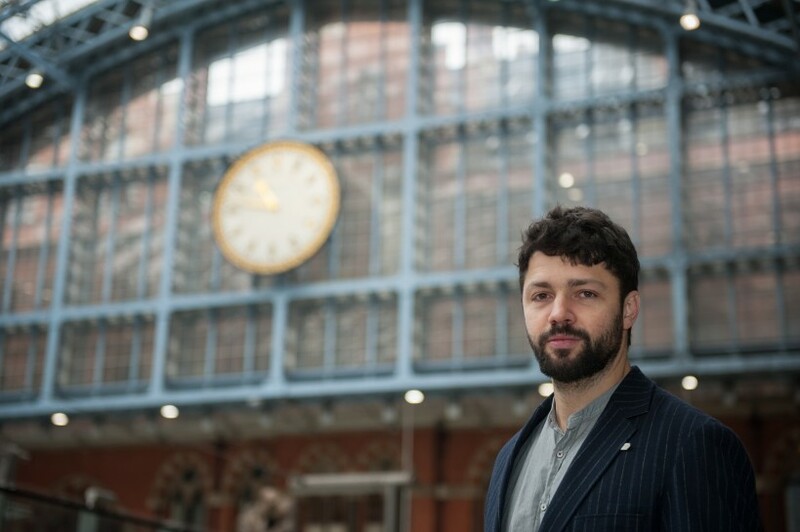 Royal Academician Conrad Shawcross has been selected as the next artist to be commissioned for Terrace Wires at St Pancras International, the station's public commissioning programme for new artwork by leading international artists. The Interpretation of Movement (a 9:8 in blue), 2017, which will be unveiled at St Pancras International station on the morning of Thursday 22 June 2017, is Shawcross's largest mechanical work to date, stretching out to a 16m diameter as it methodically turns above the station. Consisting of three articulated arms driven by a complex sequence of gears, the mechanism drives three “optic sails”, which expand and contract in an orbit from the centre where they eclipse each other. Shawcross's commission is third instalment of a four-year partnership between HS1 Ltd. (owners of St Pancras International) and the Royal Academy of Arts for the station's public sculpture series. Image: Conrad Shawcross at St Pancras International. Photo: Sam Lane Photography.